Don't underestimate yourself...#DopeyChallenge can be for you! One little link on Facebook has sparked a revelation for me. 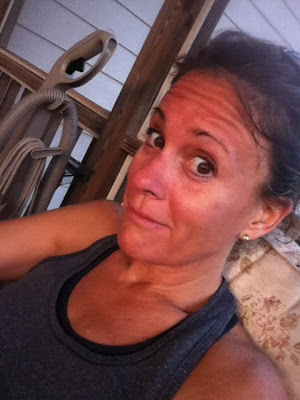 I'm so used to being a "runner" that I've almost forgotten how it may appear to other people. 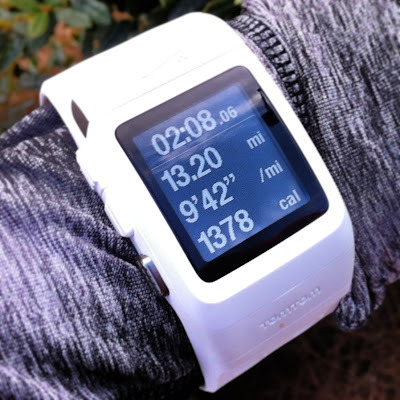 I read really great and inspiring blogs from fitness authors, follow tons of people on twitter that are experts in just about anything running related, and have met tons of friends in real life that I run with regularly that are just flat out better, faster and much more competitive than me. Over the course of 5 years I've ran 5k's, 10k's, sooo many Half Marathons that i've lost count (somewhere around 25 I think), 4 full marathons and 2 of those were Goofy Challenges (Half Marathon on Saturday and the Full Marathon on Sunday, 39.3 miles in two days). Not bragging, just stating the facts here. 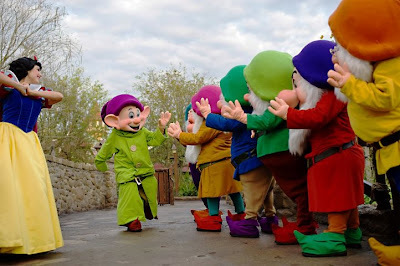 I posted a link on Facebook to the runDisney page announcing the new Dopey Challenge (5k+10k+Half Marathon+Full Marathon=Dopey Challenge) and a friend sent me a text saying.."you're not really going to consider doing that are you?" Well between this text and my preacher's sermon, this got me thinking....she thinks I'm crazy. She thinks I can't do it. Why would she think that? Am I crazy? What in the world AM I thinking? I did Goofy Challenge and survived...WHAT'S THE BIG DEAL???? What's her problem anyway? I bet she doesn't really like Disney...I bet she's one of THOSE kinds of people. I bet she thinks I'm one of THOSE kinds of Disney people. OMG. I'm really overanalyzing this text. What I had to do at this point is stop and think about it logically. There was a time when I could NOT run a 5k straight through. 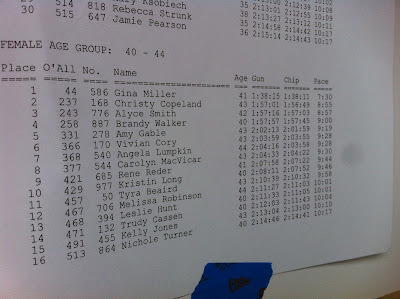 There was a time when the word "Half Marathon" was not even a part of the language that I spoke. 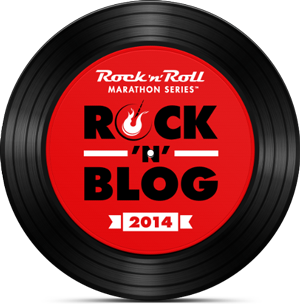 There was a time when "Full Marathon" was just another number on my bucket list that I only dreamed of crossing off one day. HOWEVER, today is not THAT time. 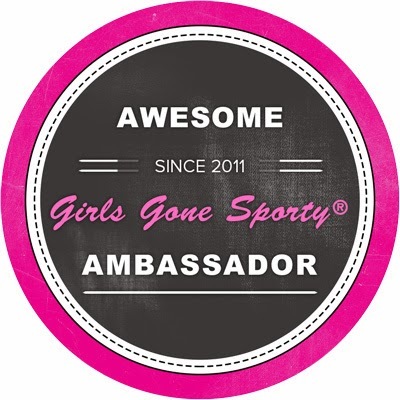 I have completed two Goofy Challenges and yes they were tough, the first one because of the unknown and the second because I ran it solo (my sis was hurt and could not run), but I finished those and for no other reason than I had it in my mind to train smart and accomplish my goal. I realized after I had those medals around my neck that I love the "Challenge" aspect of the race! I could run a Half or Full Marathon in my hometown but it would not be the same. The training is obviously not something that is for everyone. And it may not be. That's the truth but I do encourage you to get out there and try training for something new that you think you just can't do. You will 1., Surprise yourself and probably do really well and 2., Have a sense of pride that you may not realize you possess! Just train smart. There is just something about running through the Disney Parks first of all that is very sentimental to my heart but to be able to accomplish something that alot of other "normal" people only dream to accomplish is another thing! I was a dreamer too and still am...just like to turn my dreams into reality. I realize now that there are no "normal" people out there....anyone can cross things off of bucket lists. While some may say they are inspired by me, I'm just the opposite. 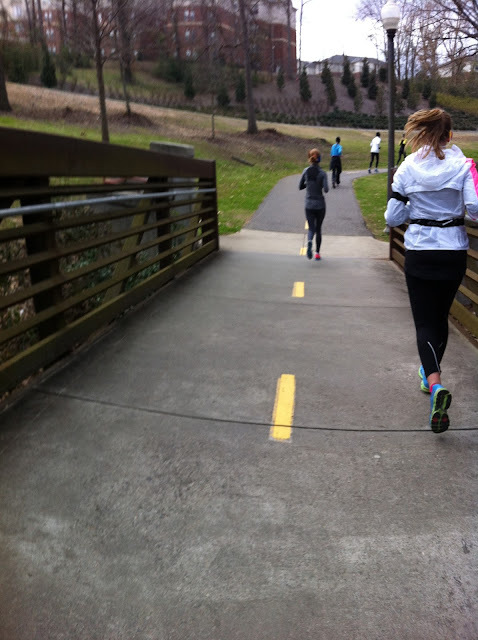 I'm inspired by my friends who have just started running and complete a 5k or by those who change their diet and drop 20 pounds or those who have just ran their first mile straight through. 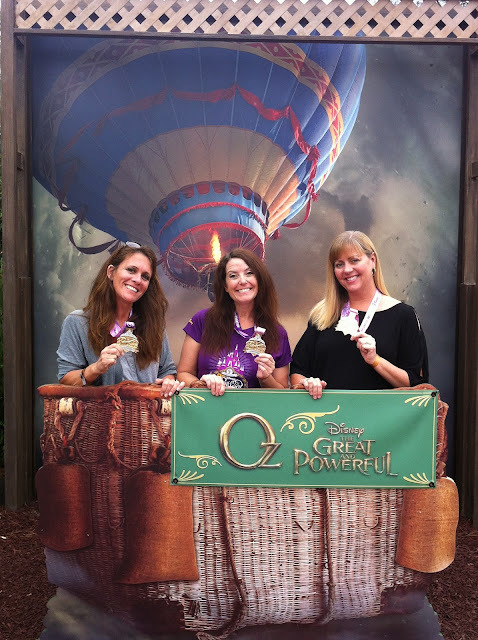 And don't even get me started on my excitement if they register for their first RunDisney event. It seems so crazy but those are the types of things that got me excited to run in the first place. 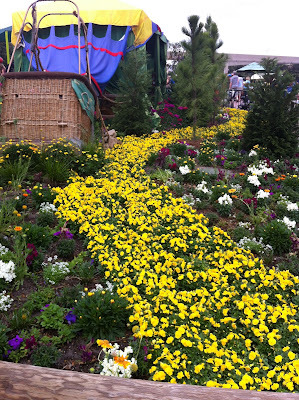 Back to my story...I cannot imagine now ever running "just the full" at Disney again. 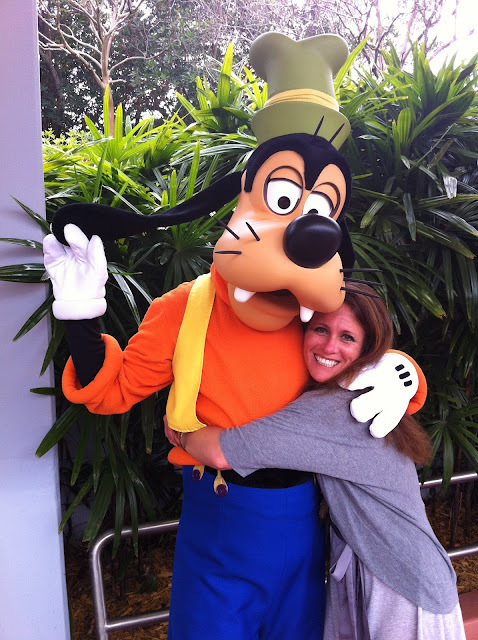 I think I will always want to do the Goofy and even crazier now, the Dopey! I am one of THOSE people and I'm okay with that. What I don't want to lose sight of though, are the reasons I started running in the first place. 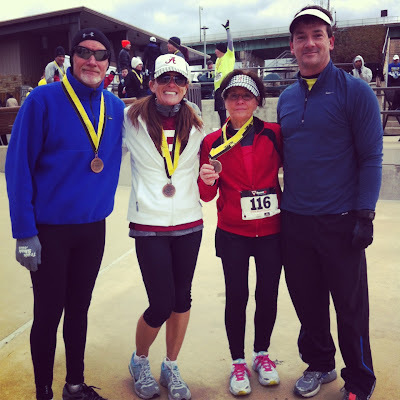 The simple 5k's, stress relief, the good exercise, running with friends. I am keeping my training in check and don't want to go overboard with the craziness but I do still love a good challenge. I will begin training most likely in June and will try to be as smart and disciplined as I can be. After all, it's a goal that I want to accomplish but don't want to neglect my family and real life along the way! So the answer to the text is YES, I am Challenging myself to run the Dopey Challenge next January at Walt Disney World...What's YOUR Challenge???? 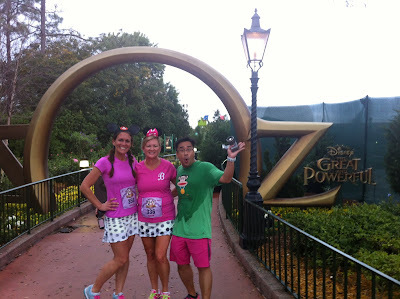 Introducing the New Dopey Challenge during Marathon Weekend at Walt Disney World. **Be sure to check out RunDisney.com for all of the latest and greatest news on the RunDisney events at Walt Disney World and Disneyland. 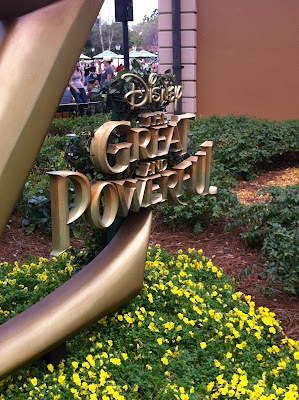 **Registration for Dopey Challenge and Walt Disney World Marathon Weekend Presented by Cigna will open April 9th, 2013. 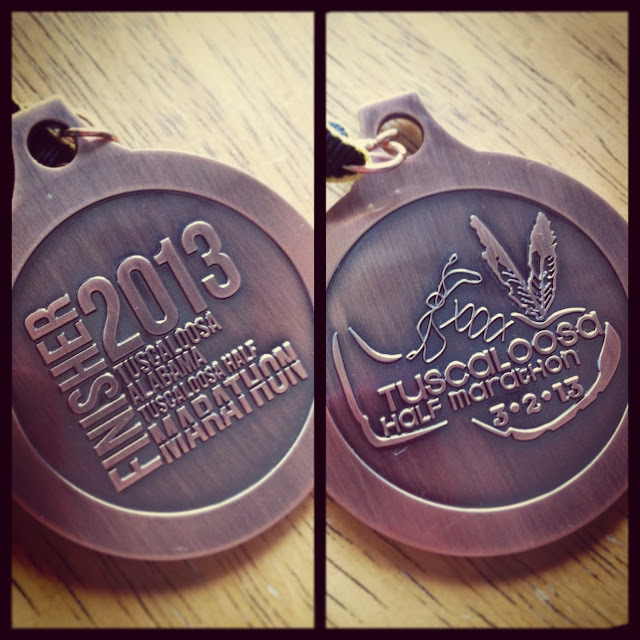 Tornadoes, Tuscaloosa Half Marathon and my PR! Live pic from my TV...The tornado over 5miles away from this shot! 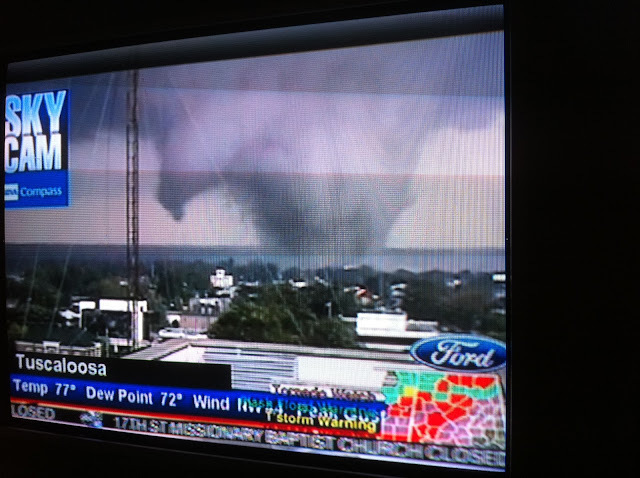 This was the live pic on my tv in April 27, 2011 when the absolute worst tornadoes swept through Tuscaloosa, Alabama. We knew there was going to be bad weather, the weather guys had been saying all week "prepare for storms at the end of the week". What I did not realize was that these multiple tornadoes would be one of the worst set of storms to ever roll through. I had a feeling when I woke up that morning and heard our local weather guy, James Spann, say "this is one of those days that as a weather man that you really hope you don't have to see in your career". I knew at that exact moment that I definitely would not be sending my kids to school that day (yes, the schools were still open) and would not be heading in to work either. The hubby went off to work and when I watched the first set of tornadoes rip through Cullman, Al. on the live screen, I called him and immediately told him to get home. I'm not gonna lie, I've never really been one to overreact to storms. We seem to get them all of the time here, but now, we take it seriously. We heed the warnings! The hubby got home from work early and we were still kind of counting it as an "off day". The kids were outside playing. After all, it was HOT outside. But it was still weird too. The sky had a weird vibe and I knew it was coming. The hubby fell asleep and I was still watching the weather. It was heading towards Tuscaloosa now. Heading there quick. I saw it on the radar but when I saw it on the live cam, OMG. It was huge! The pic from the tv was still even 5 miles away and it was soooo big. I had friends in Tuscaloosa. 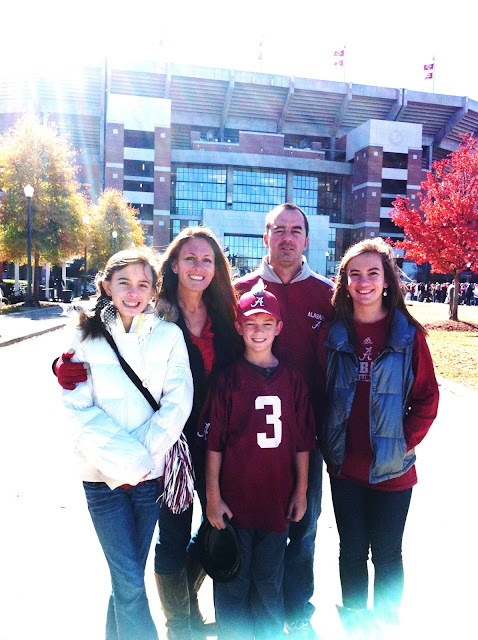 Family in Tuscaloosa. I was screaming at the hubby to get up. "You have got to see this!!". GET UP!! I watched it all happen and prayed and prayed and prayed that it not hit the University of Alabama with all of those college kids. Oh the families. Oh the Moms and Dads who had kids there. Oh no. This is BAD. This is BAD. OH CRAP. I only live 30 minutes from there. It's headed here next. NOOOOOO!!!! My phone rang, it's one of my bff's in the driveway. They wanted in my basement. They didn't have one and we did so they drove over. It's flooding outside now. This is insane. We still had power and I had been charging every electronic device in my house. I downloaded the 33/40 weather app and was going to try to keep up that way if we lost power. I'm sooo worried now because we never lost tv and I just watched 1000's die in Tuscaloosa. I can't handle this. Still to this day I'm not sure if it would have been better to lose the power and see it all in the newspaper the next day and not watch it live. But then I think, had I not seen it all go down live, I probably wouldn't have taken it so seriously. The storm is turning and not going to hit my hometown. Thank the Lord. We ended up losing the power for a little bit but had it back on after a few hours. Then the stories started coming in...ugh. I couldn't stop watching the video footage from students posting youtube videos. The damage was incredible. 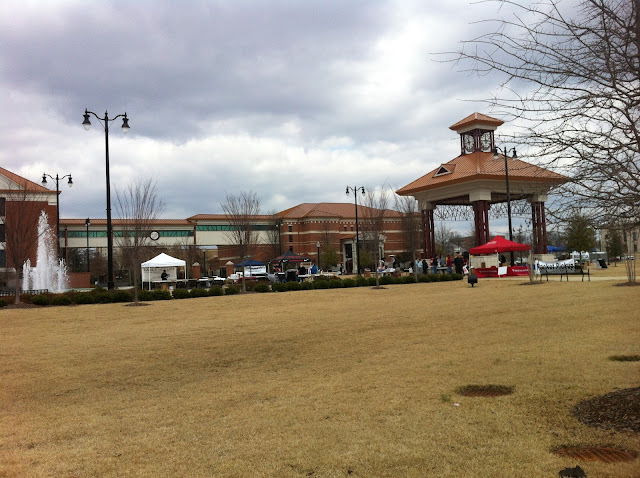 People were finding things in their yards from Tuscaloosa from hundreds of miles away. WORST storm EVER. Fast forward almost two years....Tuscaloosa is finally being rebuilt little by little. Everyday I see new things being added. The Krispy Kreme (which was legendary on McFarland) was one of the first things to be rebuilt. Whole apartment complexes that were demolished are being built again, repairs being made everywhere. Miles and miles of destroyed homes have been cleared away and concrete slabs remain ready to be built on again. The list goes on and on. Alberta Baptist Church being rebuilt. 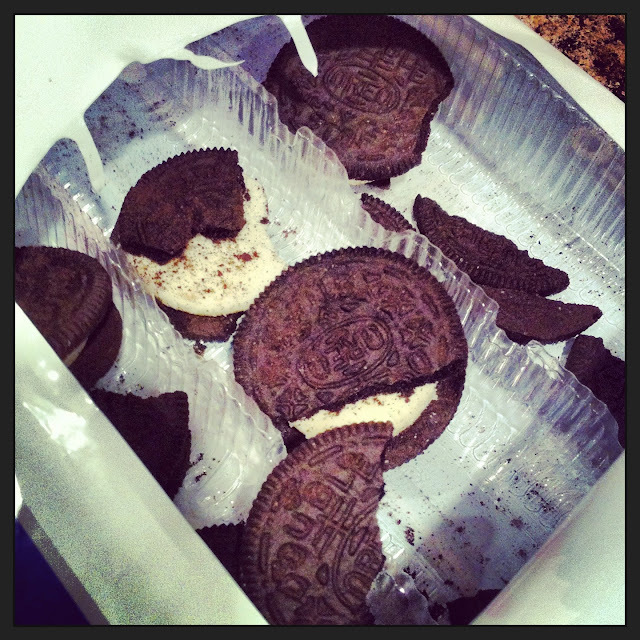 Devastation cleared. Flat land everywhere! 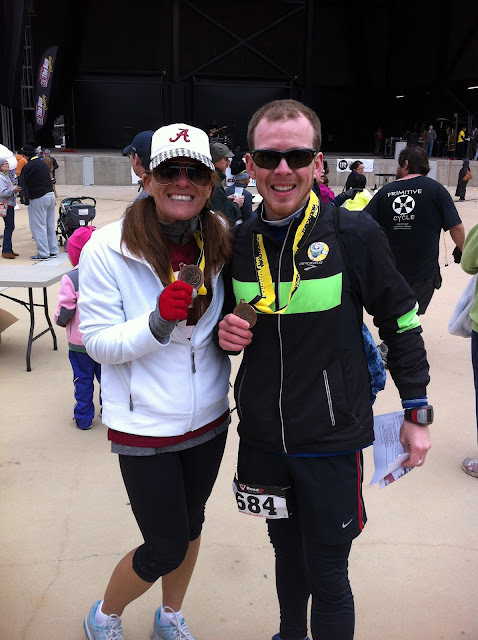 So when I heard of the Tuscaloosa Half Marathon with all proceeds going towards "Building Toward Recovery", I knew I had to do my part and run it. 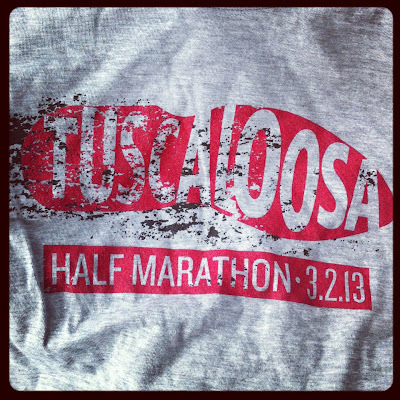 Here was the Tuscaloosa Half Marathon Mission Statement: "The mission of the Tuscaloosa Half Marathon is to encourage healthy habits and exercise, while also aiding in recovery efforts from the April 27, 2011 tornado that ripped through Tuscaloosa County. Benefiting organizations for the Inaugural Tuscaloosa Half Marathon and Fun Run are ReadBAMARead (readbamaread.org) and the Kiwanis Club of Greater Tuscaloosa (playgroundsforttown.com). 100% of event proceeds will go toward rebuilding efforts for the playgrounds and school libraries that were affected throughout the county on April 27, 2011." Run for a purpose. Run toward recovery. Headed to the Finish Line, running along side of the River. I wish I could have spend a little more time Friday afternoon at packet pickup/expo but it was an outside event and I was freeeezing so I just couldn't make that happen. 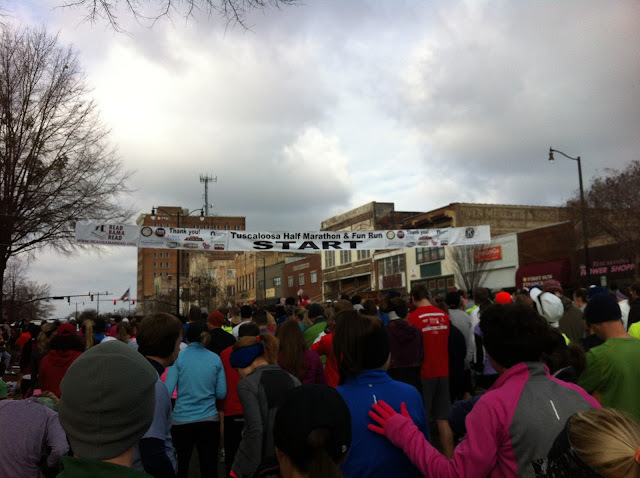 I got to the race early Saturday morning, had no trouble finding a place to park, hit the restrooms and then headed towards the start line. It was in the 20's so I was ready to start running! 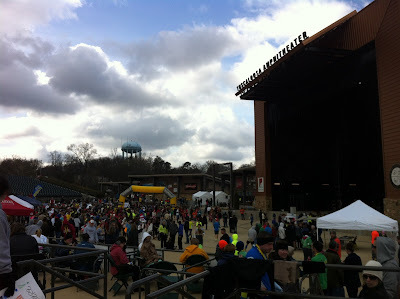 13.1 miles later, I crossed the finish line a happy girl and enjoyed my time at the Tuscaloosa Amphitheater (home of the finish line party). I was really excited to get to go the Amphitheater. I've not been before and now I'm really hoping to catch a few concerts there this summer. They have great lineups and now I can see why! 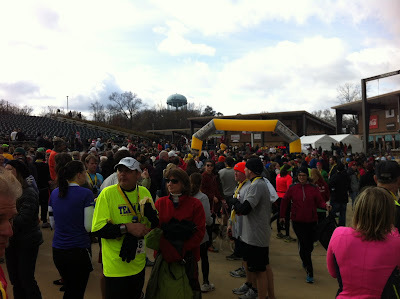 There was lots of water, bananas, Jim N' Nicks BBQ and even HOT coffee! The coffee was a HUGE bonus for me because I was sooooo cold after I cooled down. Tuscaloosa Amphitheater and Post Race Party! Ran into #TeamRunDisney friend Joe B. Raymnond! Fun! 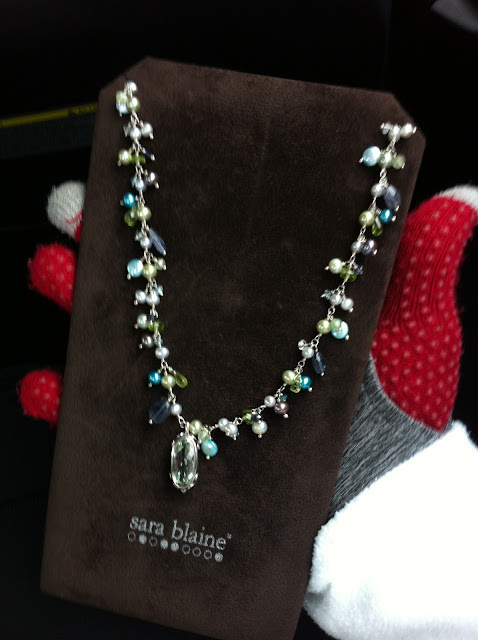 Closeup of my Beautiful Sara Blaine Necklace! 5th in my age group. Bummer. I'm not sure of the exact number of finishers in the race (I had heard there were around 1000 people registered) but for this to be the Inaugural race, I'm thinking they raised a good amount of money to help in the recovery efforts. Being a huge Alabama Football fan, Tuscaloosa Al. 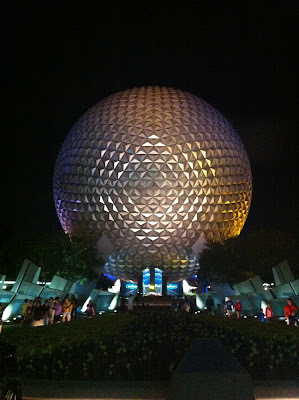 is one of my favorite places in the world (well aside from Walt Disney World)! The thought of something happening to my city was just devasting. There are so many things that are different now but so many things that are even better now. Adding races and recovery efforts over the next few years will definitely help in the healing/rebuilding process. I thoroughly enjoyed the race and will definitely run it again. My only complaint was that the lanyard was Yellow and Black! I wanted it to be Crimson Red or Houndstooth!! But other than that, no complaints on my end. 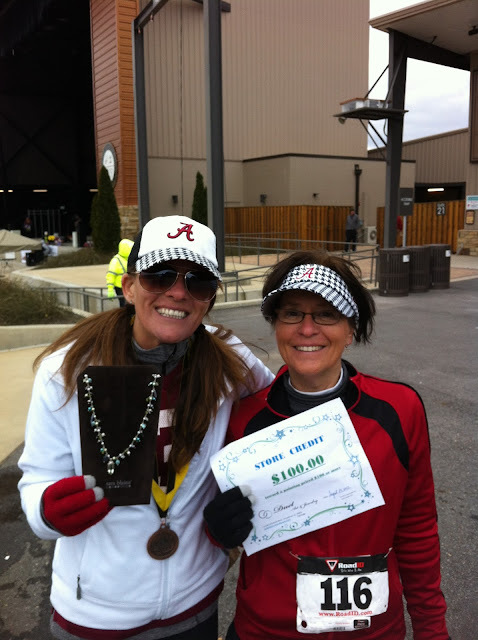 Well Done Tuscaloosa Half Marathon!! Thank you for an excellent race and see you again next year!! Roll Tide!! 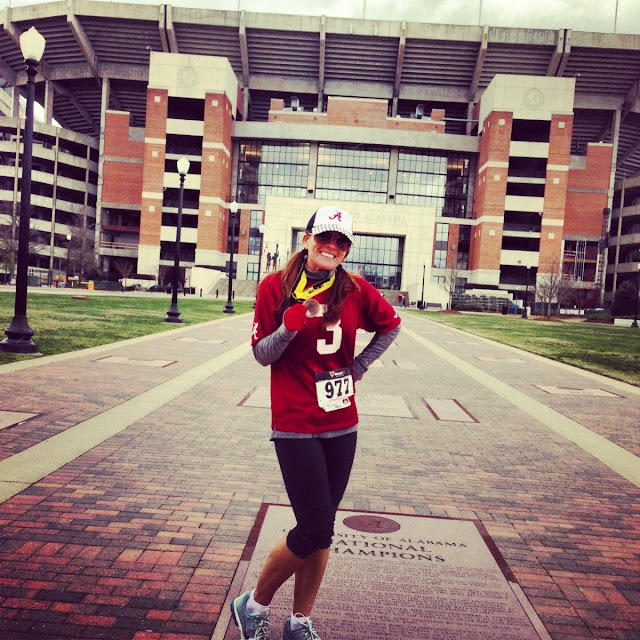 Sporting my Bling at Bryant Denny Stadium, Home of the Alabama Football National Champions.... One of my favorite places in all of the world! 1. Running Towards Recovery....Love the cause. 2. Running in one of my favorite cities. Roll Tide! 3. Post Race Party Rocked! 4. The course was challenging...and I love a good challenge! 5. Loved the event shirt...super soft and grey. Sooo tired of white race shirts! The Longs est. March 20, 1999. So I'm laying in the bed, it's our 14th wedding anniversary and we're watching Duck Dynasty. Sounds exciting huh?? 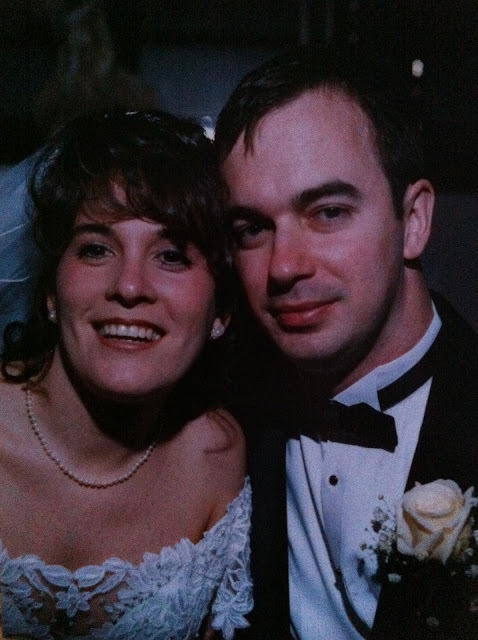 The kids are gone to the grandparents this week for Spring Break and I decided to break out a few old wedding pics. Gaaaaah...when I look back at this wedding picture, I barely even recognize these two people. "We've come a LONG way baby" is an understatement to say the least!!! 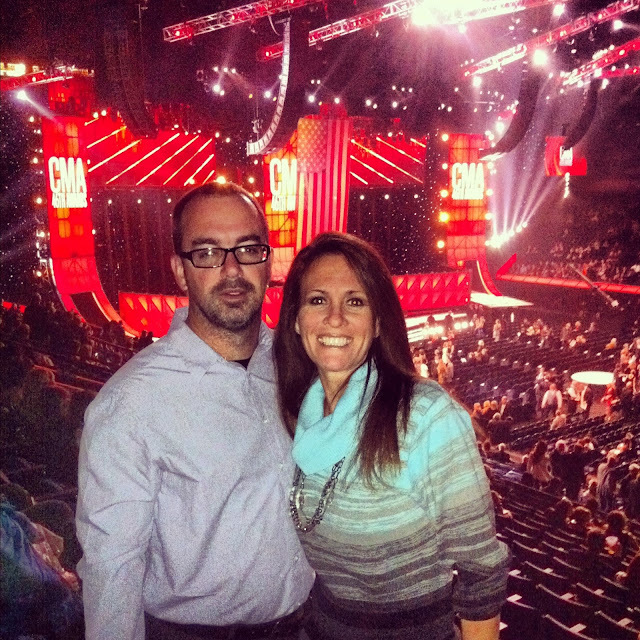 I've been married for 14 years now to my hubby and it has been great, well for the most part. I would be lying straight through my teeth if I said it was always easy, always fun, always exciting. No that's not it at all...it's been life! It's been a life full of raising kids, working hard and learning how to be a family. And it's been a life that I don't want to ever live without. David and I met in college and knew within a few months that we would be most likely be getting married. We got an apartment together, took alot of fun college classes and talked about getting married and so we did. We started having kids right away and by February of 2003, we had three little babies. I still can't believe to this day that we lived through three kids ages three and under but we did. And boy did we learn ALOT. And fast! Our house has always been crazy, loud, chaotic but most importantly HAPPY. Our kids are a perfect blend of the two of us... witty, athletic, nutty, caring, tall, they have a great sense of humor but most of all they are just good kids with sweet hearts. I'm proud of how we've raised them so far and how they are turning out! Ummm yeah. We made these people. lol. Through it all, we've always tried to have "date nights" and vacations for just me and the hubby. Don't get me wrong, we've taken the kids on plenty of vacations too but the quick getaways are always needed! They are draining us financially and I'm thinking they are going to keep doing that. Lol. Raising a family in today's world is just expensive. Not to mention, we will have three kids in high school and then three kids in college at the same time. OMG. I'm a pretty strict mom when it comes to learning the value of a dollar. Even when I have lots of cash to spend on them, I am most concerned that they realize that money doesn't grow on trees and they realize that they will never have everything nor should they want everything. Being grateful is a good thing. Sometimes gratefulness is such a hard lesson to learn but such a valuable one. Family Hangout Spot...Bama Football, Roll Tide ya'll! So THIS just happened a couple of nights ago at my house. Yep. That's right. FRIED OREOS!!! I've been to several craft shows, county fairs etc. 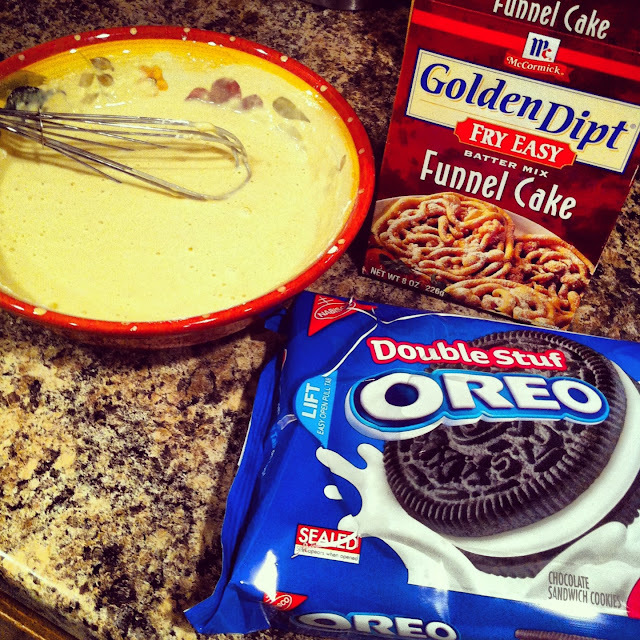 where these types of desserts are sold and I'm a big fan of funnel cakes and Oreos so I thought we'd give to a whirl here at my house. I live in Alabama and we'll fry up anything around here. We followed the funnel cake batter instructions on the box, mixed in one egg and water, dipped the oreo in the batter and dropped in a preheated pan of vegetable oil (around 1/2" deep). 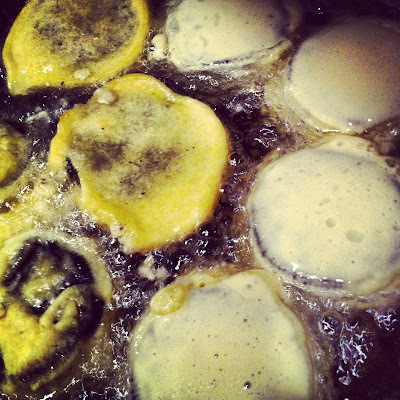 Fry for a min or two on each side until golden brown and then place on paper-towel lined plate to absorb grease. 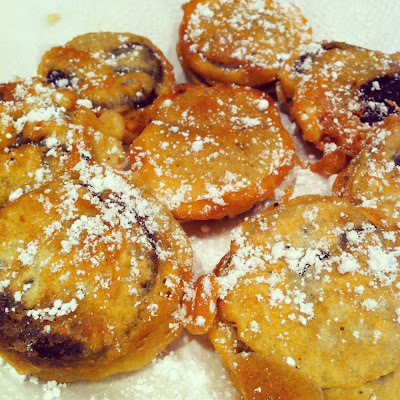 After the fried cookies, yes I just said fried cookies, cool then sprinkle with powdered sugar. The first batch going in for the fry! A plate of the finished project! 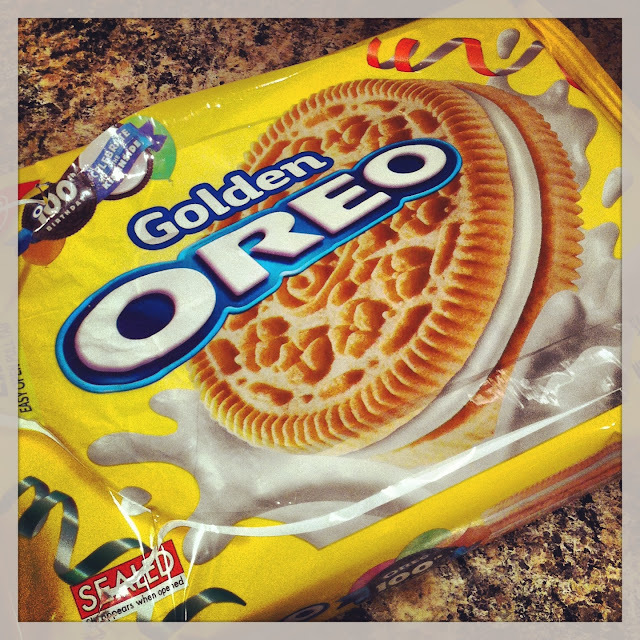 Mix it up with Golden Oreos....they are just as yummy! 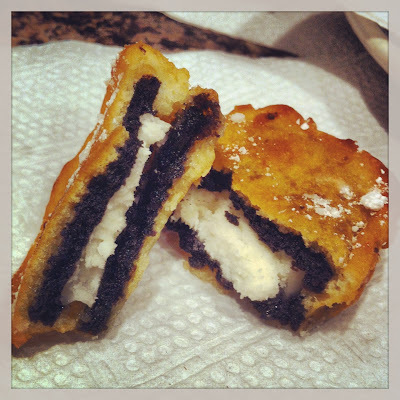 One last picture of this fried up fabulousness! Land of Oz Garden... A pics post! 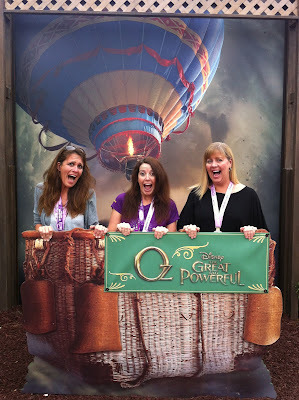 Here are a few more pics from our 'meetup' at the Land of Oz Garden! 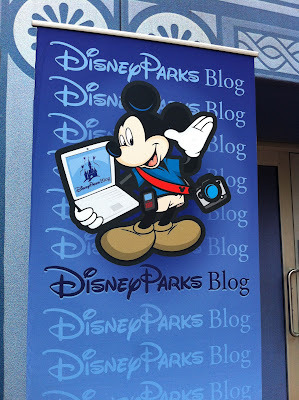 Read my Official Re-Cap of the Disney Parks Blog/#DisneyOz Meetup Here. Enjoy! We had to stop for a photo-op during the Royal Family 5K throughout Epcot! 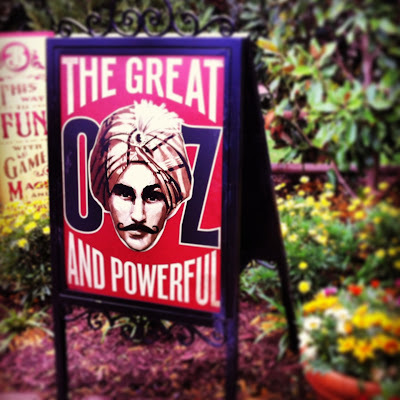 Fun Signs posted in the Garden. Tornado Alley in the back of the Garden. 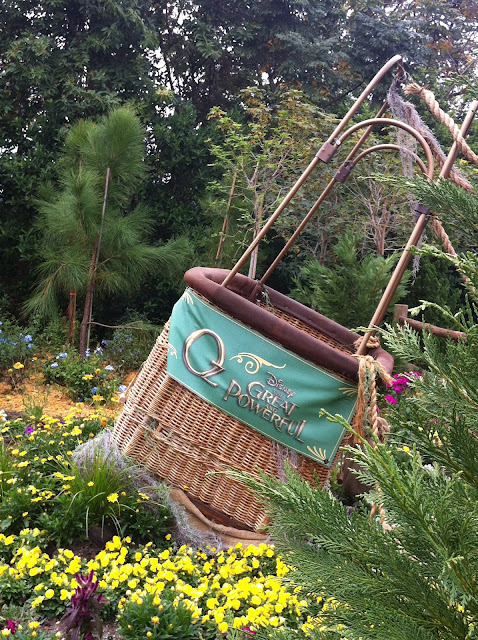 The Hot Air Balloon Basket dropped into the middle of the Garden. Are we headed to Ozzzzzzzz?1?!?! 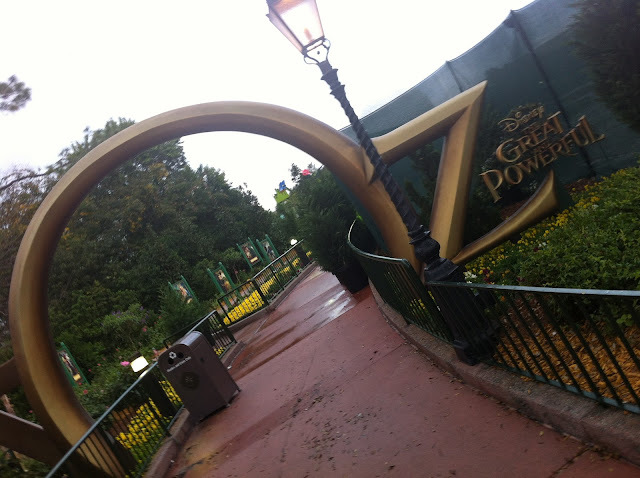 The Entrance to The Land of Oz Garden in the World Showcase at Epcot. **Be sure to check out The Disney Parks Blog for all of the latest and greatest updates about Walt Disney World, Disneyland, RunDisney, Disney Cruise Line and more!! Oz The GREAT and POWERFUL...Sneak Peek from Epcot! Rarely ever do the stars align for me that I would actually be able to attend one of the Disney Parks Blog Meetups. However, just a couple of days before I left for Princess Half Marathon Weekend, I was shopping along in Target when the tweet came through regarding the sneak peek of the new Oz The GREAT and Powerful Movie! 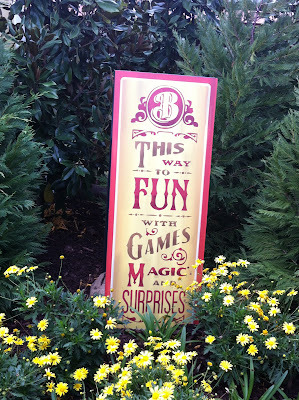 As soon as I saw that it would be during the time I would visiting the Disney Parks, I knew I would be applying quickly! I knew that this would not just be "any ole" movie, especially if it was to be hosted by the Disney Parks Blog. Heck, they could give me a glass of water and just talk Disney all day and I would love it. 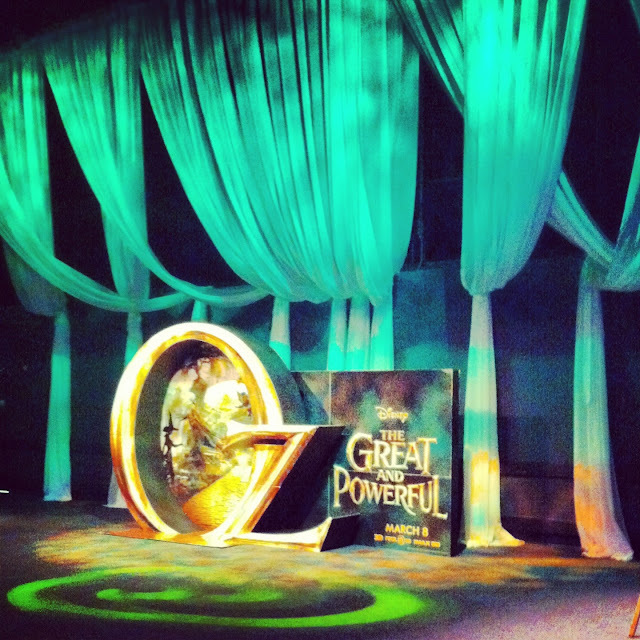 So a sneek peek of the movie? YES Please!! 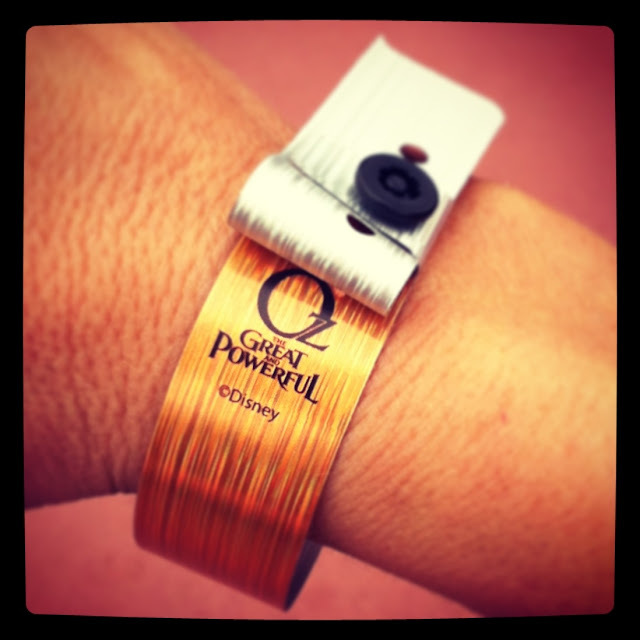 Such a cool VIP Meetup Wristband! So I got the email confirming that I would be invited to attend and OH MY GOSH was I excited!! !I won't give out any spoilers on the actual movie but I will tell you how the meetup went down! 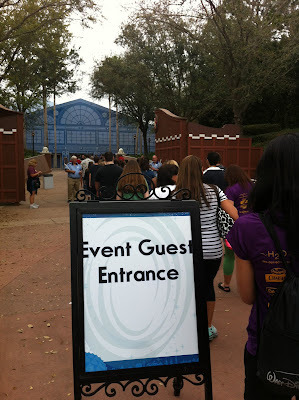 First we gathered and signed in outside of Epcot where we received a pass to enter in if we didn't have one already. We were told to meet at the "Barn doors" just past Canada in the World Showcase at 4:30. Movie would start promptly at 5:00. I grabbed a quick pic with Goofy on the way in, rode SpaceShip Earth with lots of my Princess friends and then headed on over towards the World Showcase. 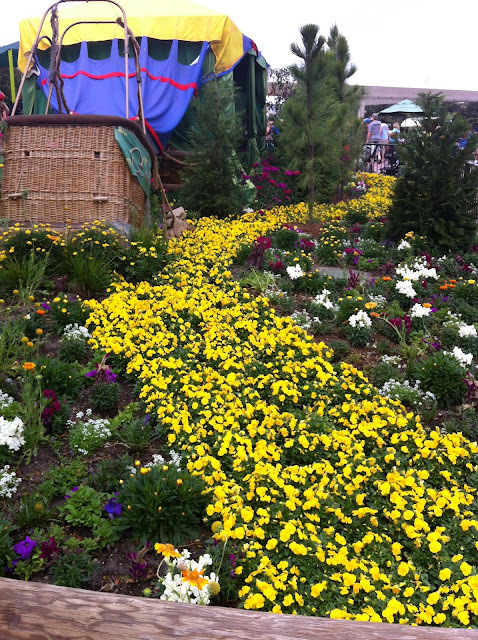 On my way in, I wanted to take a little stroll through the new Land of Oz Garden and see what that was all about. LOTS of jokes had been made about this garden all week long because I had been stalking out the Disney Parks Blog to try to get in on the RunDisney Princess Half Meetup. 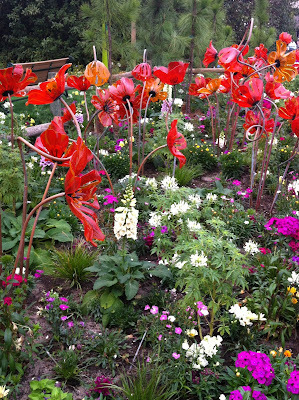 The page had been stuck on the article about the Land of Oz Garden for hours! And yes, it did just magically appear! ;) I didn't make it in to the Princess Half Meetup so this was making up for it for sure!! Sporting out Princess Half Marathon Bling in the Oz Balloon! 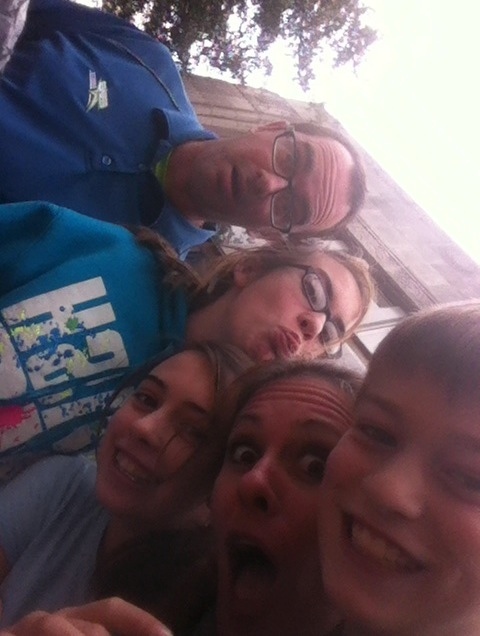 We waited in line for 15 minutes or so before they let us in. We proceeded to head in and then were asked to kindly hand over any electronic devices. OMG. No phones, no cameras, no battery chargers, nothing. We were about to be without these for at least two hours. WHAT????? 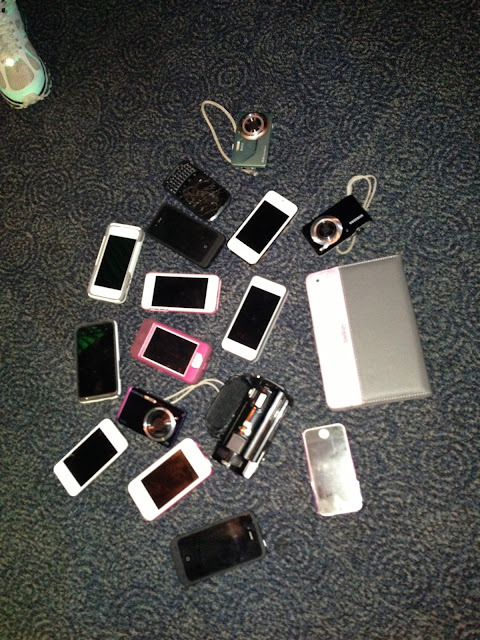 Bloggers and Social Media Junkies with no phones!!!! 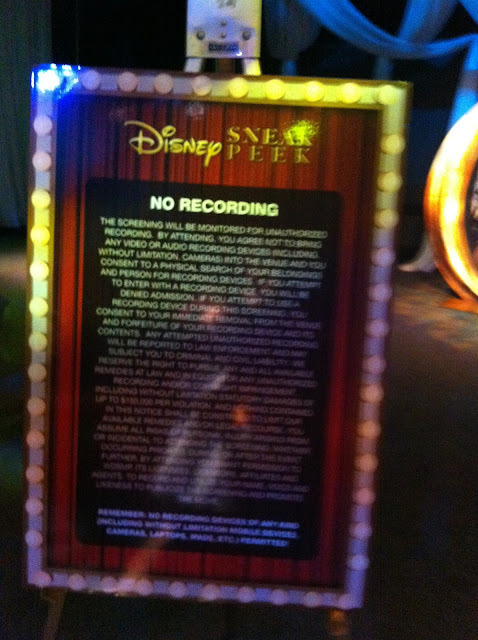 THAT's the reason that there are not a ton of pics from this event! This is what is looked like after my friends and I retrieved our phones...Can you say CONNECTED?? But with or without phones (I managed to snap a few quick pics on my way in), it was a really fun event. We were treated to some yummy delicious "Sweet and Salty popcorn, Pretzels, White Chocolate and Edible Gold" and "Flying Monkey Punch". The Disney Parks Blog team played lots of "Oz" trivia from previous movies with us, gave away some cool prizes and then we settled in to watch the movie. Goodnight from Epcot!! Go see the movie in 3D and enjoy...I know I did! **Make sure to check out Disney Parks Blog to see the latest and greatest news and information regarding Walt Disney World, Disneyland, RunDisney, Disney Cruise Line and more! Place popcorn in a large bowl. In a microwave, melt white chocolate and butter; stir until smooth. Pour over popcorn mixture and toss to coat. Add the pretzels, nuts and salt. Sprinkle a little Gold Dust for the shimmer. Combine Orange, Passion Fruit and Guava Juice. Stir and then slow add in Sprite. 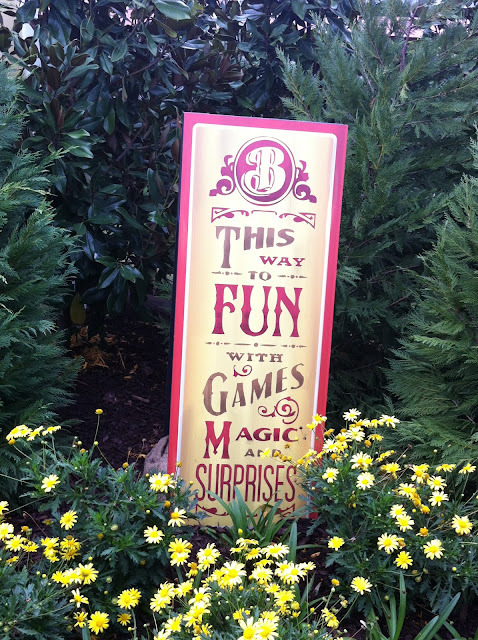 Cute little Disney Parks Blog banner! **Recipes for Sweet and Salty Popcorn, Pretzels, White Chocolate and Edible Gold and Flying Monkey Punch Courtesy of Disney Parks Blog. So I've really been working, running my kids around and taking things waaaay too fast since the start of the year so I decided to get back to my Sunday naps (which I love) and slow down just a bit. So far so good! Two Sundays in a row with 3+ hour naps and I'm feeling FABULOUS. The weather was out of control beautiful this weekend! Sunny and 70. Yes!!!! I started my day off today by going to church, then out to lunch with the fam. That's pretty much the norm around here. 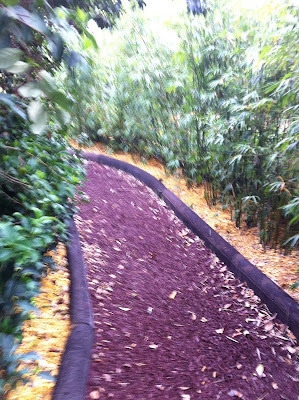 Insert three hour nap now, woke up, grabbed a quick cup of joe and then off to run! Got three quick miles in.. 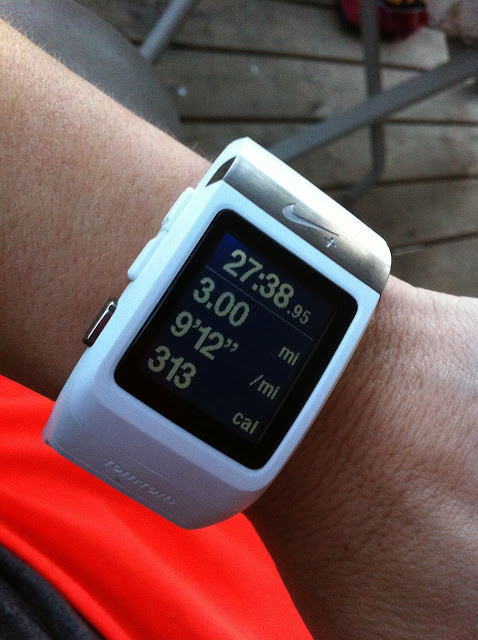 I've been running in my neighborhood lately and don't really know why because its SOOO hilly! 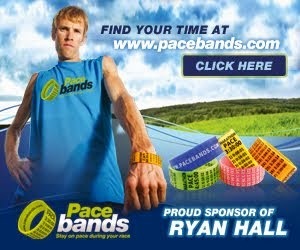 It is good for speed work though, which comes in handy on race day. I'm sitting on the back porch watching my little boy play in the backyard now, which is another thing I love to do...just watch my kids be kids. And yes, that IS a vacuum cleaner on the back porch in the pic. Insert *real life* here. :) So that's it for today. DEFINITELY not a bad way to spend a Sunday!